What was it about Emerson College that played such an important part in the lives of so many young people? Having joined the college early in its genesis, Michael Spence served as a key decision maker, administrator and teacher for more than a quarter of a century. 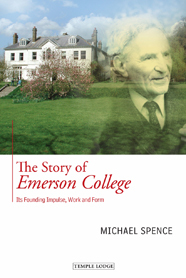 In this first biography of Emerson, he gives a vivid picture of how the college came to be such a special place. But this is not a dry history of an organisation: it is brought to life with vibrant descriptions of many people, including the college's founders Francis and Elizabeth Edmunds and John Davy, but also students, teachers, cooks, gardeners, accountants, administrators, and many others. Michael Spence studies the anthroposophical spiritual basis that formed the bedrock of the college. As he states: "It was the recognition of the reality of the spirit, which informed all aspects of the college life and organisation, that made it such a unique place to which so many people came. Did they find at Emerson an expression of something which, in their descent from spiritual worlds into this life between birth and death they had already sensed, of the social and spiritual life of humanity that was striving to come into being?" MICHAEL SPENCE was born in 1931 in Kenya. When he was 15, his family returned to England where he attended Michael Hall School. After graduation and national service in the army, he worked variously in a London shipping office, for the Kenya Police and in a finance company. At the age of 36 he was invited by Francis Edmunds to join a group of people developing Emerson College. Michael was closely involved in its evolution, carrying responsibilities for finances, administration and the campus. He also ran study groups and lectured on the threefold nature of social life at Emerson College, North America and elsewhere, and is the author of Freeing the Human Spirit (1999) and After Capitalism (2012).